The Chinese government's commitment to build the country into a maritime power offers growth opportunities for the Qingdao West Coast New Area, which has abundant marine resources and robust sea transportation. As a key juncture on China's Belt and Road (B&R) route, the West Coast New Area encourages local enterprises to expand presence in markets along the route as well as welcome foreign firms to make investments in the local markets. In order to overcome challenges related to going global, Chinese companies need to enhance competitiveness by improving their comprehensive and innovative abilities, said a local official. As the first ray of the sun glistens through the mist over the Qingdao West Coast New Area, local ports embrace a busy day with a crowd of cargo ships. Manufacturing products including tire, cranes and electronics are waiting to be shipped to overseas markets from the ports. Located on the west coast of Qingdao, East China's Shandong Province, the new area focuses on the development of the marine economy and emerging marine industries, and serves as a strategic base for deep sea and offshore exploration. At the 18th National Congress of the Communist Party of China held in 2012, China vowed to build the country into a maritime power. That entails enhancing the capacity for exploiting marine resources, developing the marine economy, protecting the marine ecology and safeguarding China's maritime rights and interests, according to a central government document. The central government's plan offers opportunities for the development of the new area, which is rich in marine resources and supported by robust sea transport, Li Fengli, director of the Qingdao West Coast New Area Administration Committee, told the Global Times on Friday. The Qingdao West Coast New Area, the ninth State-level economic development zone in China, was established in June 2014 with the approval of the State Council, China's cabinet. The new area covers 2,127 square kilometers of land and about 5,000 square kilometers of ocean. Two local ports - Qingdao and Dongjiakou ports - provide services to more than 700 ports in over 100 countries and regions in the world, according to Li. Thanks to these advantages, the new area aims to expand the scale of its marine economy to 165 billion yuan ($25 billion) by 2020, accounting for 33 percent of the area's GDP growth. More importantly, the new area would continue to pursue economic growth in a sustainable way. "Polluting factories have been closed and energy-intensive industries are not welcome in the area," he said. The potential of marine economic development for the new area will also push more domestic firms to seek growth in markets covered by the Belt and Road (B&R) initiative. The B&R initiative, which refers to the Silk Road Economic Belt and the 21st Century Maritime Silk Road, was proposed by China in 2013 with the aim to build a trade and infrastructure network connecting Asia with Europe and Africa along the ancient trade routes. As a key juncture on the B&R route, the new area is beefing up efforts to strengthen cooperation with countries and regions along the route as well as actively encouraging local enterprises to go global. Located at the entrance of Jiaozhou Bay, Qingdao Haixi Heavy-Duty Machinery Co (HHMC) has endeavored to expand in foreign markets, especially in countries and regions along the B&R route, aiming to become a global brand. The State-owned HHMC is professionally engaging in design and manufacturing of port-cargo handling machinery. 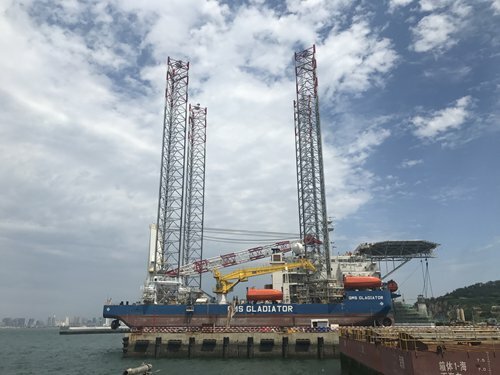 "Since the market demand in the B&R countries has kept rising in recent years thanks to an increasing number of infrastructure construction projects, different types of cranes, including automated container handling machinery, produced by HHMC have been exported to markets including Italy, South Korea, Indonesia, Malaysia, the Philippines, Mauritius, Lebanon and Guinea," Dai Zhenhua, vice general manager of HHMC, told the Global Times on Friday. When compared to foreign rivals, the differences in technology and production equipment are gradually disappearing, but HHMC still needs to learn from its foreign counterparts in engineering management, equipment design and production procedure, according to Dai. Chinese companies face some common challenges when entering overseas markets, said Li, noting that an information-sharing platform is needed to offer more comprehensive communications for Chinese and foreign enterprises for better cooperation. Chinese firms also need to find ways to enhance their comprehensive strength and innovation ability when going global, Li said. "We not only encourage local firms to invest in the global markets, we also want to attract foreign firms to the new area," noted Li. The new area offers many advantages for foreign investors, such as its solid industrial base, comprehensive business facilities, abundant talent pool and strong R&D capacity, he said. Supported by six core industries including machine equipment, vehicles and electronics, the West Coast New Area is striving to further open up its markets to foreign companies. "Convenient transportation was a major attraction for us to set up a plant in Qingdao in 2010 as the nearby Dongjiakou port and Qingdao port could facilitate the export of our products to the overseas markets," said Wu Ling, deputy CEO of environmental solution services provider Tritech Environmental Group, a subsidiary of Singapore-based Tritech Group. "Tritech developed slowly in China after our plant in Qingdao started operation in 2014 because our membrane-related products and relevant technology are still new to the Chinese market," Wu told the Global Times on Thursday. "But I am upbeat about the business environment in Qingdao as well as across China because both the central and local governments have ramped up efforts to offer support for foreign companies," she said, noting that the West Coast New Area has established a special agency to offer services for foreign enterprises. In the recent three years, the new area has brought in more than 1,000 foreign projects, with total investment around 1 trillion yuan, according to the local commerce bureau. Foreign investors in the area mainly come from countries and regions like Hong Kong, Luxembourg, South Korea, Uruguay and Singapore. Foreign investment has injected and will continue to inject vitality and vigor into the area's marine economy, with more and more overseas businesses setting base in Qingdao in the future, according to industry insiders.